Smart St. has just reached agreement for the new National Indigenous TV network (NITV) to acquire a package of our films. The network which began broadcasting in December has purchased BACKROADS, NINGLA-A‘NA, TWO LAWS and PROTECTED. These works are rare and important historical films about the struggle for justice and land rights by indigenous Australians. The network is rushing them to air in January. “Protected” will air on January 9th whilst “Backroads” and “Ningla-A’Na” will form a high profile double bill at prime time on Australia/Invasion Day January 26th. Backroads, directed by Philip Noyce and starring Gary Foley and Bill Hunter is a classic road movie, Ningla - A’Na is Allessandro Cavadini’s unique record of the establishment of the Aboriginal tent embassy in 1972, Two Laws is an investigation of the relationship between the laws of white Australia and those of the people of the Borolloola community in the Northern Territory and Protected looks at the history of Palm Island, a concentration camp created to house disparate indigenous groups from around Queensland. In December 1992 Prime Minister Paul Keating addressed a large crowd in Sydney's Redfern. For the first time an Australian Prime Minister admitted the carnage and destruction that white invasion had wrought on the Aboriginal population of the country. It was an extraordinary speech. In a strange and very happy twist of fate we’ve found the master negatives of our film PANDEMONIUM that had been lost for more than twenty years. The negatives, which had been held in a storage unit and then moved and paperwork lost. For the last few months we have been working our way back through a number of companies as each was taken over by another entity until we found someone who recalled them. “Not much chance,” he said. “We throw stuff out after seven years if we don’t have other instructions.” What a sinking feeling a comment like that engenders. Anyway we held our breath and two weeks later an email came through. Wonder of wonders - for some reason the negative and soundtracks had not been thrown away. No one knew why but a courier later and they were in our office waiting to go down to the National Film & Sound Archive where they will be stored safely. We're pleased to announce that Alessandro Cavadini's historic documentary Ningla-A'Na is now available to watch via streaming on your computer. For $5.00 you can watch the whole film without the cost or delay of a DVD. 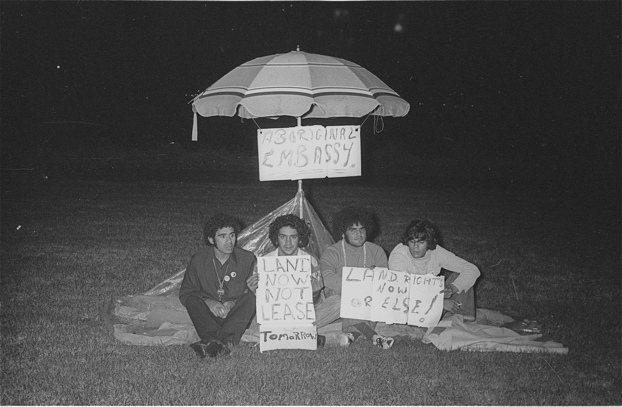 This unique history of the 1972 Aboriginal Tent Embassy grows more valuable each year. This year is the fortieth anniversary of what many regard as the most significant political protest in the struggle for justice and landrights for Aborigines. Ningla-A'Na captures the drama from the inside. A film you'll never forget. To watch the film click through to it's catalogue page, click the "Rent Movie" link and enter standard info. Payment can be by paypal, credit card or debit card. It's quick and you can be watching the film within a couple of minutes.